Soar along on a clever girl’s flight of fancy in a whimsical ode to free spirits, inventiveness, and flying pigs. Zephyr is a girl who loves airplanes. She draws pictures of them, makes them out of paper, builds them out of junk, and hopes one day to fly one of her own. But when Gramma, Daddy, and Mom are too busy to play airplane with her, Zephyr’s excess enthusiasm gets her sent to her room — where she discovers a secret door that leads to the most wondrous place she’s ever seen! 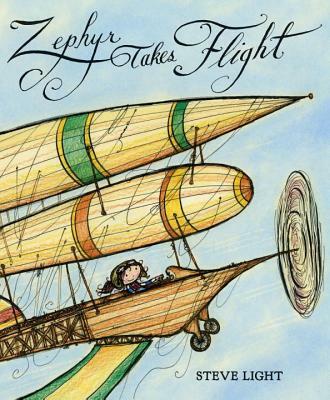 Lovers of flying machines and gadgets, along with adventurers of all kinds, will be buoyed by this lighthearted tale of a little girl who finds her wings. Steve Light is the author-illustrator of many books for children, including The Christmas Giant. He lives in New York City. The combination of a strong-willed girl and imaginative art that soars makes this one a worthy choice. Light (The Christmas Giant) taps into the allure of flying, the charm of old gadgets, and the joy of secret spaces in his lighter-than-air fantasy. Mr. Light's swishy, zoomy illustrations give lift to this cheerful adventure that ends, as adventures should, with warm reconciliation and a plate of hot pancakes. Imagination takes wing in this picture book about a young girl who dreams of flying...The colored pencil illustrations are imaginative and offer enough detail to keep the reader’s interest, which makes this a good read-aloud.